Here's my memory of Munchos: I went to Derham Hall, an all-girls' high school in St. Paul, and our cafeteria had a kitchen, but it was only utilized for weird special parents' nights or something once in a blue moon. We had modular scheduling, where you might have three hours between classes, or if you were like me, you might take so many courses that you were lucky to get one 15-minute break all day. So the cafeteria had to be open all day, it couldn't ever close, because 9 a.m. or 2:30 p.m. might be your only chance to have lunch. So instead of a hot lunch kitchen, we had vending machines. Which we thought was AWESOME, and much cooler than our boys' school and their regular hot food. And one day my friend was eating a weird chip she found in the vending machine. It came in a shiny red bag and looked more like Funyons or insulation or plastic coating than it did potato chips. And it was deliciously salty, and wonderfully artificial tasting, and totally addictive. And it was Munchos, and after that it became the hot chip at our school. Turns out Munchos wasn't a 1980s find, though--Wikipedia says 1973, but YouTube dates this Jim Henson commercial -- with a very early version of a PURPLE Cookie Monster -- to the 1960s. Who's right? It seemed like Munchos vanished for a while, but guess what? Munchos are back! They can be hard to find, but check chip aisles in all your stores. They are apparently considered a bargain chip as they have the price -- usually $2 -- printed right on the bag so the store can't reprice them. Do you have Munchos memories? Or memories of any other fave potato chip to share? I don't think Munchos ever went away. I have been eating them pretty regularly for as long as I can remember, and don't recall ever having a problem finding them. Maybe it's another case where availability by region varies a bit. As to the date of their origin, late 1960s - early 1970s seems right. I can remember eating them as a very small child, though I don't remember that commercial. I love Munchos! We've always had them here in NY/NJ, and they're just so much lighter and crispier than other chips - they're my favorite. This may sound gross, but I like to break them up and mix them into tuna for a great crunch. Try it - so yummy! Thanks for the help, Gael. Hope this works!! Delurking to say I've been able to find Munchos for a while now after not seeing them on store shelves since the mid-80s. My local supermarket carries them, but I think they only bring them in once a week. For the longest time the only place that had them was one deli near my house, and only in small bags. Come to think of it, I've never seen a large bag of Munchos. 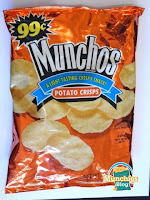 I found a big bag at Byerly's in the Twin Cities over the weekend, brought it home, and had my first Munchos experience. Extra crunchy -- and awfully good with dip. I expected them to be a little foamy, like puffcorn, but they were all crunch. And loud. tato skins and o'boisies are long lost chips of my youth. tgi fridays makes a tato skins-alike, but not the same! i miss you, cheddar and bacon tato skins!